Most ships dock at the deep water harbour near Bridgetown, on the island's south-west corner. 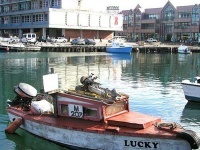 The port offers many duty free shops, and Bridgetown is easily accessible by taxi or shuttle. Once in Barbados, holidaymakers will find a wealth of attractions and activities, as well as stunning beaches. Year-round great weather makes Barbados a superb cruise destination. Packages and specials are available throughout the year, ensuring that travellers can, at any time, pack their sunglasses and set sail.